I was digging in the back of my closet the other day and found my old sketch books. I used to do a lot of pencil drawings back in college and was so excited to find these! I'd estimate that I did these particular sketches around 1998-2000. 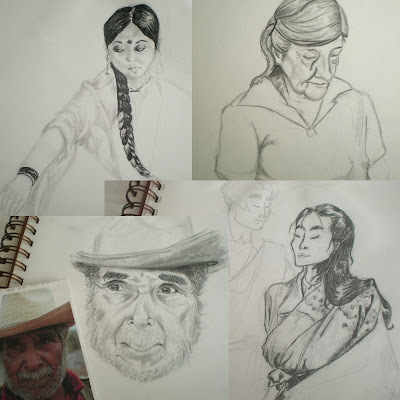 Seeing these made me realize that I haven't picked up a pencil to actually sit down and draw for over 5 years. I was really into portraits. 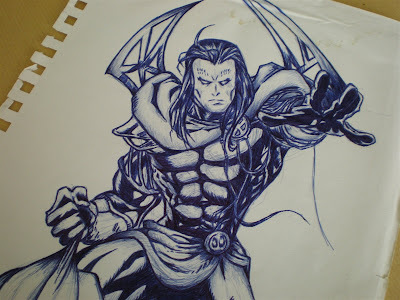 I was also really into Xmen and Anime-type art with dreams of going to school to become an animator. I actually didn't go to school for art at all. I majored in Marketing/Sales. The only art class that I ever took was a painting class. Somehow I ended up behind a sewing machine with fabric as my medium of choice, making baby clothing and accessories. Far from Xmen an Anime that's for sure! It's still good to look at these sketches and reminisce to earlier days. ....and I think I just might be inspired to pick up a pencil and sketch pad again! Wow, thanks for sharing :) Terrific drawings Charissa...and I bet we all probably have some cool forgotten artifacts like that around in a dark corner somewhere! Anyone else have cool hidden talents? Or other fun stuff we don't already know about you ;) Now I'm dying to know...!